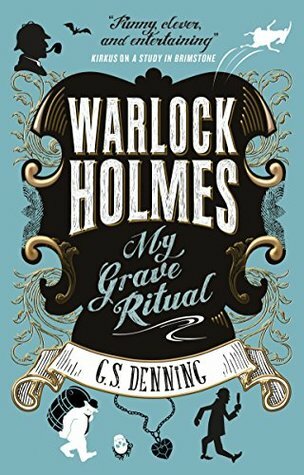 This third installment of the author’s paranormal parody of Arthur Conan Doyle’s famous detective features Warlock Holmes, a hapless, frequently helpless practitioner of dark arts who is riddled with demons that occasionally prove useful, but more often threaten the sanity of Dr. John Watson, who is not the sidekick, thank you very much, but the real brains behind the crime-solving duo. This anthology of short stories is based off Conan Doyle’s originals, but in this version the separate cases tie closely together to reveal a larger plot that is hinted at throughout the book. Nightmarish prophecies where living porcelain dolls reveal a ritual that portends someone’s death and the escape of the disembodied Moriarty, cast out of Holmes at the end of the last volume, spells impending doom if Holmes and Watson cannot solve the mysteries, capture the mastermind, and save the world in time. All of Conan Doyle’s most notable characters are present, though some in altered form. Scotland Yard Inspectors Lestrade and Greggson come to call, though their non-human natures, a vampire and troll respectively, offer complications that Conan Doyle never envisioned. Mrs. Hudson is her mirror opposite in every way, and street urchin Wiggles, in this version a lycanthropic shape-shifter, also pop in to add to the mayhem. “The Woman,” a.k.a Irene Adler, makes multiple appearances, but this time it is hopeless romantic Watson who is obsessed with her, to the point of his foretold and inevitable “death” at the end of this volume. Time will tell if mortal Watson’s death “takes” or is somehow retracted by Holmes, especially as the next volume of the series, The Sign of the Nine, is due out in April of this year. G. S. Denning does an admirable job of copying Conan Doyle’s style along with the language and mannerisms of 1890s London, while adding his own unique twists and turns to the genre. As a long-time fan of all things Holmesian as well as paranormal stories, I greatly enjoyed the two previous volumes in the author’s series, A Study in Brimstone and The Hell-Hound of the Baskervilles, and look forward to the next two planned volumes. I give My Grave Ritual five stars, and recommend it to anyone who enjoys a spoof of Sherlock Holmes, paranormal stories, or just a light-hearted take on detective fiction.